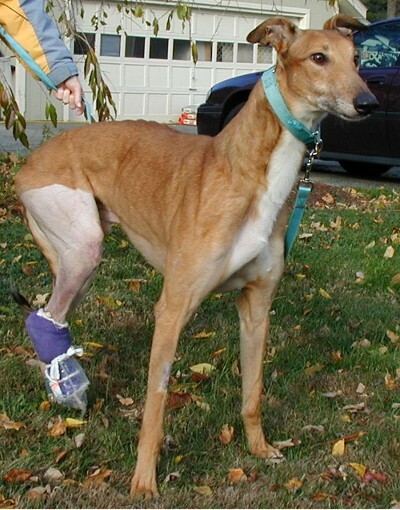 Yogi Medical Fund – We Adopt Greyhounds, Inc.
On October 26, 2004 WAG received a call about “RTS Yogi Bear” who had broken his leg during a race. 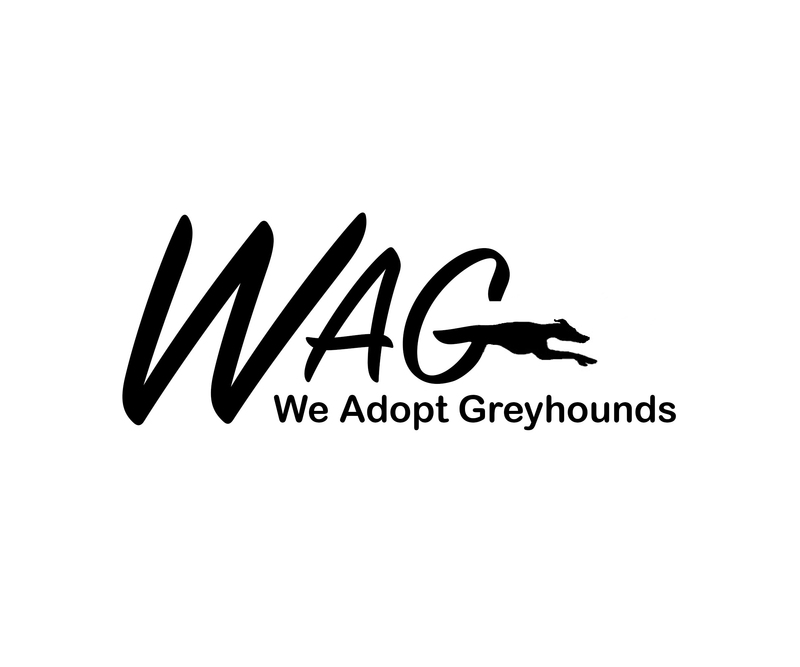 WAG had never been able to take broken leg hounds in the past and we were not sure exactly what to expect. When we were told all the other groups were full and Yogi had nowhere else to go, we decided to give it a try! Two days later, Yogi Bear arrived in his new foster home. He had a cast on his leg and we were told that his injury was minor (although no x-rays were provided) and that we should just leave the cast on for 6-8 weeks and he should be okay. Unfortunately the next day, while his foster family was at work, Yogi decided to free himself from his crate, he managed to open the door of the crate enough to squeeze himself out, but in the process, took off his cast. He happily greeted his foster family, hopping around on 3 legs, without the cast his injury didn’t seem all that minor. We brought him for his first vet visit for x-rays to evaluate the extent of the injury just to find that our local vet had never seen this type of sports injury before and was not sure how to repair it. The vet’s advice was to take Yogi to an orthopedic surgeon. We called the local orthopedic specialist’s office and found that he was away on vacation and wasn’t due back for another week. At that point, we remembered that Greysland in Massachusetts had a lot of experience with broken leg hounds and maybe they could help. Through Greysland, we were introduced to Dr. Melissa Dudley at VCA Northboro. Dr. Dudley was able to see Yogi right away and surgically repair his leg. Now all we had to do was make sure that Yogi would be a good patient and not injure his leg again, which was easier said then done for a dog who did not like being in a crate or ex-pen. However, we didn’t have anyone who could be with him 24 hours per day so there had to be some kind of solution. His foster family found that he was particularly fond of one corner in their family room and that he didn’t mind being blocked into this corner with a baby gate – so the corner became Yogi’s crate. It took twelve weeks for Yogi’s leg to heal. Yogi had a little harder time finding a new home because besides his dislike for crates, he was also a little too interested in cats. On August 7, 2005 Yogi was adopted by his new family. After gaining some experience with Yogi, WAG decided to continue to help out with some of the more special needs hounds whenever possible. In honor of this first experience, WAG named the medical fund for these special hounds after Yogi. To view past Yogi Medical Fund recipients, visit our Past Yogi Medical Fund recipients page.